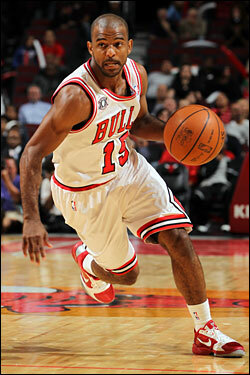 The Bulls added John Lucas III to their roster on Friday. Lucas, who was released by Chicago in training camp, was signed in part because the Bulls might not have Derrick Rose Friday when they face the Nuggets. Oh no! Yes, the Bulls’ star guard Rose is listed as questionable for Friday’s game in Denver with a stiff neck. As of late Friday afternoon, Rose was getting massage and chiropractic treatment, but indications were he would not play unless it loosened up substantially. The Bulls intend to be extra conservative with Rose, especially because they are in the midst of a four games in five nights stretch at the end of this long, Western Conference road trip. The Bulls conclude the trip Saturday in Sacramento. The Bulls felt they had to go with someone like Lucas because they wanted someone in for Friday’s game in case Rose could not play. Lucas was not playing and was at home in Houston. He was believed to be considering a return to play in China, where he played last season with the Shanghai Dongfang Sharks. He appeared in 40 games and averaged 27.9 points and played in the Chinese All Star game. He is a 5-10 guard regarded more as a shooter, but in college first at Baylor then Oklahoma State he ran the team and left Oklahoma State as fifth alltime in assists for the school. He was all-Big 12 first team in his two seasons at Oklahoma State. Lucas, the son of former NBA coach and guard John Lucas who was an overall No. 1 pick in the 1976 draft and now a renowned trainer, had brief stints with the Rockets in the 2005-06 and 2006-07 seasons. He played in a total of 60 games, averaging about eight minutes. He averaged 3.1 points on about 40 percent shooting. Before playing in China last season, he played in the NBDL, Spain and Italy. The Bulls had two open roster spots with 13 players and rosters with a maximum of 15. So the Bulls signed Lucas to a non guaranteed free agent deal. Thus he could be released at any time or hang on given the Bulls have open spots and C.J. Watson has struggled at times at point guard. Bulls coach Tom Thibodeau had been a strong supporter of Lucas in camp when it came down to last cuts and Lucas and Kyle Weaver were released. So the decision Friday morning when Rose’s stiff neck got worse was likely between Lucas and Weaver since the Bulls wouldn’t have time to get someone to Denver for the game and give a player a physical as well as having someone who would be a bit accustomed to their team. So they opted for Lucas, who turned 28 this past Sunday, especially because he was not involved with another team. Weaver is playing in the D-league for Iowa. Lucas usually wears jersey No. 15 because that’s the number his father wore.